Most people you pass on the street have a general understanding of augmented reality/virtual reality (AR/VR). But a team of undergrads at the University of North Carolina at Chapel Hill, led by Brian Moynihan of the UNC Health Sciences Library, are not only creating a new way of thinking about these technologies, but exploring new possibilities for thinking with them. The students and Moynihan developed the Brain VR project, which combines electroencephalogram (EEG) data with AR/VR and allows users to control a video game using only their minds. Users train the system by thinking “up” or “down,” enabling them to fly across a virtual landscape using only their thoughts. 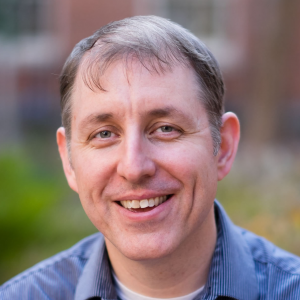 While many people are familiar with the capabilities of AR/VR, Moynihan wanted to bring this technology into the classroom to challenge students to explore different possibilities for how the technology could be used. UNC student Grady Hale (right) demos the Brain VR technology at the 2018 UNC Innovation Showcase. Interested in taking a class on entrepreneurship and innovation, while getting involved in leadership and learning opportunities outside the classroom? The Brain VR student team included Carolina undergrads Jonathan Monroe, Mark Molinaro, Ronald Ding, and Grady Hale. As the students worked to translate and apply data collected from the headbands, they faced a daunting task. EEG data can be very “noisy” to work with, especially when it comes to VR. Many times, more noise than signal is produced. In a laboratory setting, users can sit, relax and read while EEG data is pulled. In VR, users are getting up and moving around, which can affect the data. As the Brain VR project came together, Moynihan and Monroe wanted to share the project with the wider public as an example of innovation taking place at UNC. With support from Innovate Carolina, Brain VR was able to participate in the Triangle Sci-Tech Expo at the North Carolina Museum of Natural Sciences in Raleigh, which attracted more than 5,000 visitors from across the region. “What is notable about that event is that people from all walks of life attended – from computer scientists in Research Triangle Park to elementary school kids – everyone was excited to experience VR,” says Moynihan. Arriving early and staying well past the end of the event, Moynihan and Monroe were peppered with questions from curious visitors. 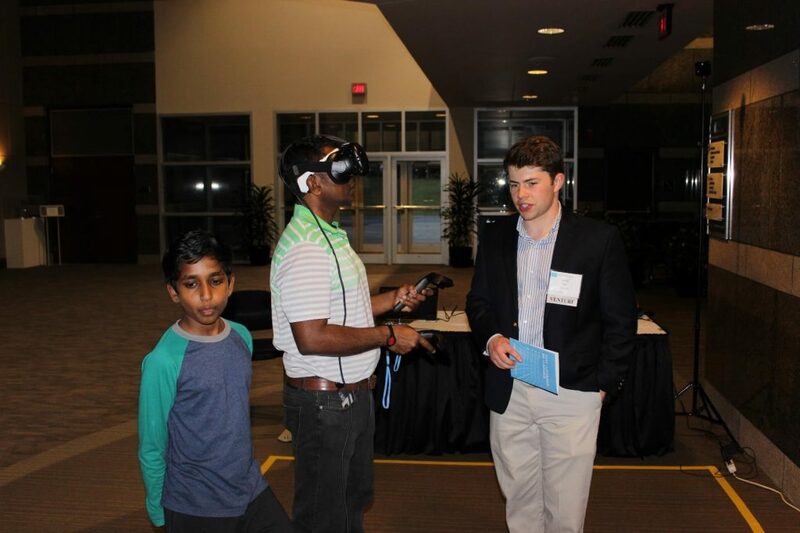 The event gave them the opportunity to share their excitement about AR/VR as well as expose people of all ages to the cutting-edge research and innovation happening at Carolina. The UNC Health Sciences Library loans devices to students, faculty and staff, including activity trackers, sleep trackers, and motion control devices. For example, if a doctor with UNC Hospitals wants to learn how their patients are using a Fitbit, the doctor can check out a Fitbit to become more familiar with the technology and consider how to improve care for their patients. To foster faculty, student and staff interest in AR/VR, Moynihan has created a campus AR/VR Interest Group for research and curricular applications of VR. The informal interest group works to promote innovative teaching and learning, research, training, clinical care and entrepreneurship through the use of immersive technologies. For more information about the project as well as to access the open source code, visit the Brain VR website.